Knickernappies is a company that offers pocket diapers, organic hemp/c otton prefolds, mama products, accessories, and a variety of unique items including over-the-door-knob diaper pail bags and a large custom section (this is the only place that I’ve ever seen an argyle minkee diaper before!). They sent us a medium sized lavender colored 2G pocket diaper to try and we have loved it! The 2G pocket diapers come in 14 different colors, plus an array of prints and other fun things in the “custom” section of Knickernappies’ website. The most unique thing about their diapers is that they come with elastic in both the front and the back and on both sides of the back material where the pocket it, keeping messes in better while providing a snug fit. 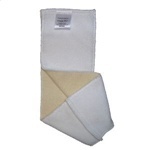 Like most pocket diapers, a fleece is used as the inner layer and a PUL for the outer layer. This allows for liquids to be wicked to the inside of the diaper (where the liner is), keeping baby’s skin dry. Side snaps give this diaper a very smooth fit across the tummy. No more poofing or drooping! In addition, side snaps are great for curious toddlers who have mastered aplix or front-snapping diapers! Knickernappies also sent me a LoopyDo insert to use with the pocket diaper. Made of two layers of thirsty hemp french terry plus two layers of ultra-thick white microfiber, the insert is prewashed and ready to absorb fluid. It’s a pretty flat insert, and is sewn into a loop which helps it dry just as fast as anything else in the dryer (if you’ve used hemp before, you know that it usually takes longer to dry). The insert is easy to use, absorbs a lot, and we also found that it fits into all of our other pocket diapers (of comparable size) with no problems. The LoopyDo 2G Prewashed Insert is actually rated #1 for all inserts on Diaper Pin and can be purchased from Knickernappies’ website for $7.49. The 2G diaper is a trim diaper, flattering to your baby, and well made. I definitely recommend it to fellow cloth diapering parents. For $15.95, I really think this diaper is worth it. Knickernappies also makes a One Size diaper for $18.95, providing a one-stop option for those who prefer that route. The One-Size diapers fit from 8-40 lbs and come in six different colors. Knickernappies can be found in 15 different countries world wide and in many different stores (and online) in the US, providing their affordable, useful, and cute diapers to everyone. Win it! 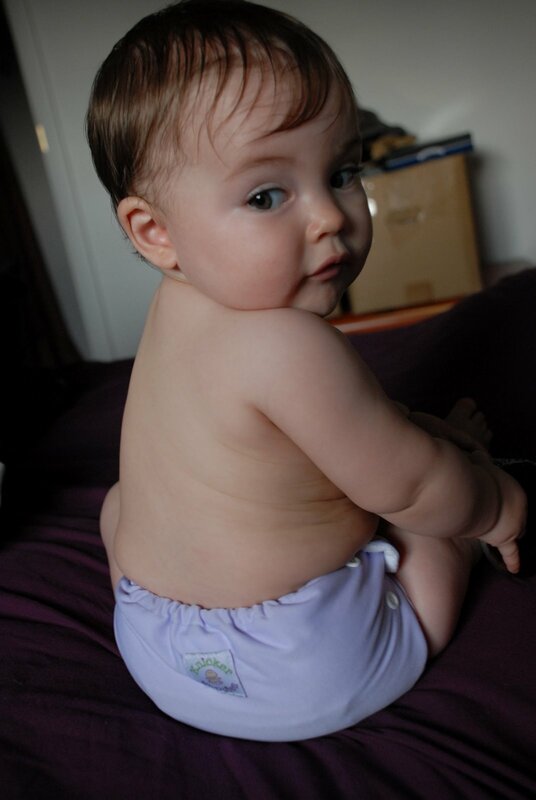 Knickernappies is giving away one of their One Size diapers to one of my readers. In order to enter, you need to visit their website at http://www.Knickernappies.com and tell me the color that you want your One Size diaper in. Earn additional entries by spreading the word (blogging, sporting my buttons, subscribing to me, following me on Blogger, faving me on Technorati…you know, the usualy stuff). Leave a message for each entry with your email address. Contest ends August 7, 2009 at approximately 1530 hours, EST. Good luck! I really love the chocolate, the celery is also nice. i love the chocolate and i would love to try these! i just started on the quest for cloth diapers for my first baby (she's 10 weeks now) and ordered a few from diaperswappers.com after I read YOUR blog! Thanks for making it simple. nodakwonder@yahoo.com. I want the brown ones! I like the turquoise colour. Hopefully I didn't miss the cutoff, mommy brain in full effect. I love the yellow ones, such a nice shade. I sport your “Life More Simply” button on my blog.